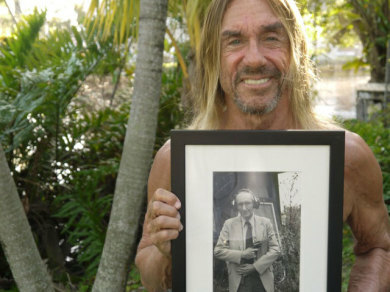 The long awaited get together – William Burroughs and Iggy Pop. Two icons and iconoclasts in one radio program Burroughs at 100. The documentary won a “Director’s Choice” award at the 2014 Third Coast Festival. Colin McNulty produced the doc for Whistledown Productions and BBC 4 . On this edition of HowSound, I’m featuring excerpts from the program as well as my interview with Colin recorded live at Third Coast. Colin and I chat about the documentary, working with Iggy, and some of the differences between documentary production in the U.K. and the U.S.
You can find the entire documentary at Third Coast’s website. And, once you’ve finished listening check out two of Colin’s favorite BBC programs: Desert Island Discs and The Reunion. He swears the BBC isn’t as stodgy as we think it is (and, he says, the U.S. is not as navel-gazey as the Brits think we are). If you enjoy Burrows at 100, you should also add Falling Tree Productions – one of Whistledown’s competitors – to your playlist. Fascinating, both the McNulty interview and his documentary. But why no mention of Burroughs’ estranged son, William S. Burroughs, Jr, also a novelist and who died of liver failure and alcoholism at age 32? Five minutes devoted to Burroughs’ love of his cats but nothing about his son? How sad.